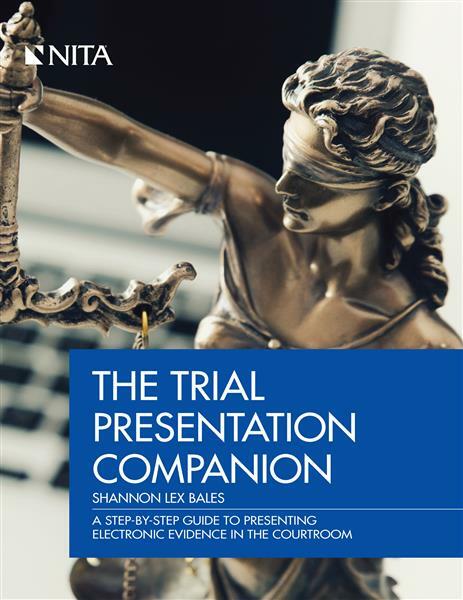 The Trial Presentation Companion: A Step-by-Step Guide to Presenting Electronic Evidence in the Courtroom, written by award-winning legal technologist Shannon Lex Bales, is NITA’s first-ever, comprehensive “how-to” manual on running electronic evidence in the courtroom. This face-saving guide will help you and your firm expand your comfort zone in working with all the bits and pieces―laptops, trial presentation software, document cameras, audio-visual components, the puzzling array of cords and cables―that are increasingly essential when presenting electronic evidence in court in the modern era. Checklists and guides are included to help your firm create a technology plan for trial and recognize where opposing firms may attempt less-than-reputable technical tactics, such as burden shifting, to throw a monkey wrench in your trial plan. For the judiciary, the book presents a warts-and-all view of trial technology and discusses reasonable presentation obligations by firms to the court and how the court can ensure more efficient technological processes and fewer problems in the courtroom. Part One, Trial Presentation in Theory, is just that: a theoretical explanation, in plain (and often tongue-in-cheek) English, about why expert trial technologists do what they do during pretrial and in court―how to organize and name exhibit files, choose the best software for your needs, build a trial kit of equipment to take to court, comply with the Trial Management Order, develop an effective workflow, cultivate relationships that provide mutual support in court and out, and much more. Included as a free bonus are ready-to-use forms and checklists for you to download and use to help you mind the details of your case. Part Two, Trial Presentation in Practice, shows you, step by illustrated step, how you, too, can bring that same game to your own legal team as you huddle for trial. Even if you don’t know an HDMI port from a VGA and have never set up a folder system on your server before, The Trial Presentation Companion will show you how, and before you know it, you’ll be running the show like you were born to it. This book is suitable for everyone from judges and law firm partners and associates to law students, budding trial technologists, and paralegals.